The ‘Air ports & sea ports’ issue. UK: Manchester | Global: Australasia. The ‘Temperature controlled & perishable’ issue. UK: Liverpool & N. Wales | Global: Indian subcontinent. The ‘Customs Clearance & Bonded Warehousing’ issue. UK: Felixstowe & Ipswich | Global: W. Europe. The ‘Ocean Freight & Shipping Lines’ issue. UK: Heathrow & London | Global: Iberia. The ‘Warehousing & Storage’ issue. UK: Essex, Kent & Sussex | Global: C. & E. Europe. The ‘UK & International Courier’ issue. UK: Midlands | Global: Mediterranean. The ‘Airfreight & Airlines’ issue. UK: Solent | Global: Scandinavia. UK: South West | Global: Middle East. The ‘Hazardous & Dangerous Goods’ issue. UK: Northern Ireland | Global: Africa. The ‘Supply Chain & Retail’ issue. UK: Scotland | Global: Far East. The ‘Project Cargo & Abnormal Loads’ issue. UK: North East | Global: Benelux. The ‘European Road & Express’ issue. UK: Yorkshire | Global: The Americas. The ‘Airports & Seaports’ issue. The ‘Temp. Controlled & Perishable’ issue. UK: Liverpool, N. Wales | Global: Indian subcontinent. UK: Felixstowe, Ipswich | Global: Western Europe. UK: Essex, Kent, Sussex | Global: Iberia. UK: Heathrow & London | Global: Eastern Europe. 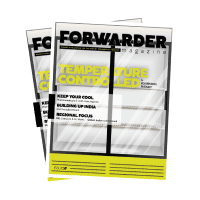 The ‘UK & global courier’ issue. UK: The Solent | Global: Scandinavia. Market it Like… Katie Elliott, Freight Media. Move it Like… Idriss Al-Rifai, fetchr. The ‘Software & Tech’ issue. Regional Focus: Hong Kong | Japan. Move it Like… Lee Griffiths, NNR. Regional Focus: China | Scandinavia. Move it Like… Stephen Carr, Peel Ports.